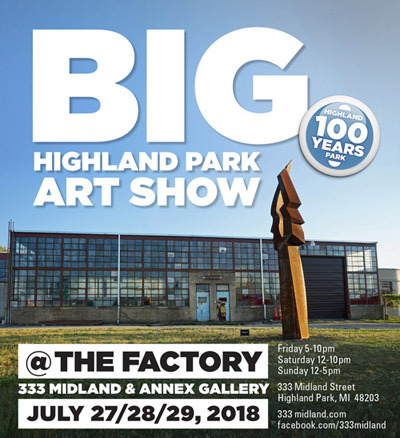 "THE BIG HIGHLAND PARK SHOW"
Micropointillist Painter Lowell Boileau will be exhibiting in the "The BIG Highland Park Art Show" at the The Factory@333 Midland celebrating the 100th Anniversary of Highland Park. Lowell Boileau lived in and maintained a studio at 45 Colorado in Highland Park from 1972 to 1999. He is exhibiting three paintings created in Highland Park during those days. "The BIG Highland Park Art Show"
NOTES: A burning warehouse in Detroit is reflected in mudd puddles etched by footprints and tire tracks. This painting is part of the series Michigan at the End of the Industrial age. *Yellow, red and blue - only colors used. NOTES: "Autumn" is an elegy of the end of industrial age Detroit. The image portrays snow geese migrating south along the Straits of Detroit, a timeless event that rises above the human fluctuations below and is emphasized by Chinese-painting-influenced mist separation of planes. This painting was the winner of the $1000 1st Place Prize 'Our Town' Competition and was part of the artist's Michigan Creative Arts Grant Award project "Michigan at the End of the Industrial Age". NOTES: Based on a group of friends saying goodbyes on Woodward Avenue in Highland Park.